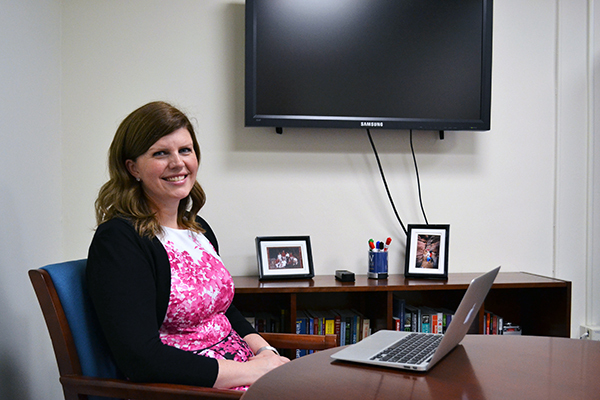 Camille Funk, the director of the eDesign shop which creates GW’s online courses, says officials want to make courses more accessible for students with vision and hearing issues. Updated: Jan. 28, 2016 at 9:47 a.m.
University leaders hope new features added to GW’s online learning programs will make them more accessible for students with disabilities. The new features include software that would allow visually impaired students to use screen-reading devices to understand the content, as well as closed captioning on videos to aid students who are deaf or hearing-impaired. Officials said adding the features would help GW be a leader in providing online educational options to those with disabilities. Former Vice Provost for Online Learning and Academic Innovation Paul Schiff Berman, who stepped down from his vice provost role at the start of this semester, said he and other officials began developing these features for students who otherwise would not be able to use the programs. Berman said officials are focusing on adding in the accessibility features to new courses, rather than adding them into existing ones, because it’s more difficult to add the upgrades to courses that have already been created. He added that making courses more accommodating for students with disabilities will benefit all students. Berman said the online learning team has also responded to individuals’ specific requests for accommodations in the past. Students who register with Disability Support Services can have note-taking assistance, interpreting or captioning services and alternative text formats, according to the DSS website. Gelman Library also offers adaptive technology like screen readers for blind or low-vision individuals. Camille Funk, the director of the eDesign shop which creates GW’s online courses, said she and others working to create the courses will look at ways to make them accessible for students with vision or hearing issues, adding that the office will also look at how to make the courses more mobile. Seth Bravin, the associate director for technology access, said the eDesign Shop and the DSS office have existing relationships with vendors who provide these services, making it easier to add those options to GW’s online courses. “We also work proactively with university stakeholders in many departments and schools as well as vendors to provide an inclusive and welcoming environment for everyone including students with disabilities,” Bravin said in an email. As online learning becomes commonplace across the nation, many universities are quickly working to make their virtual courses more accessible. Vickie Cook, the director of the Center for Online Learning, Research and Service at the University of Illinois, said that many universities, including Dartmouth College and Harvard, Boston and Clemson universities, have been helping to lead efforts for more disability-friendly online courses. “I think a lot of institutions are moving this way, and certainly, I can’t imagine that there is a university that is not aware of the need to make their online courses more accessible,” she said. Cook added that making online courses accessible for students with disabilities can have advantages for all students, whether they learn differently or need disability-friendly web design, like making sure a text is readable against certain backgrounds. This article appeared in the January 28, 2016 issue of the Hatchet.